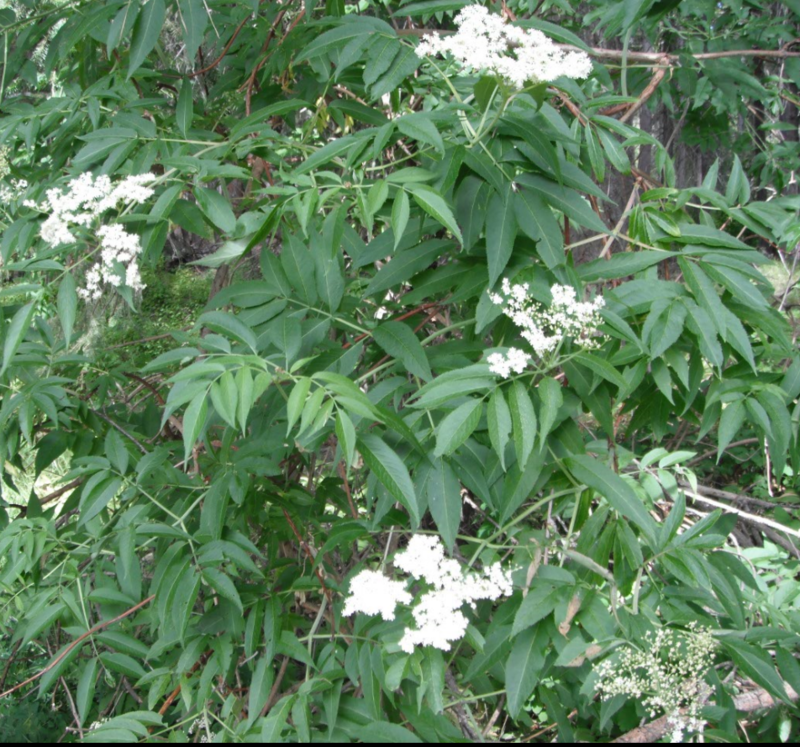 Names: The name Sambucus is derived from the Greek sambuca, which was a stringed instrument supposed to have been made from elder wood. Nigra means black; caerulea means sky-blue. It is thought the name elder comes the Anglo-saxon ‘auld,’ ‘aeld’ or ‘eller’, meaning fire, because the hollow stems were used as bellows to blow air into the center of a fire. 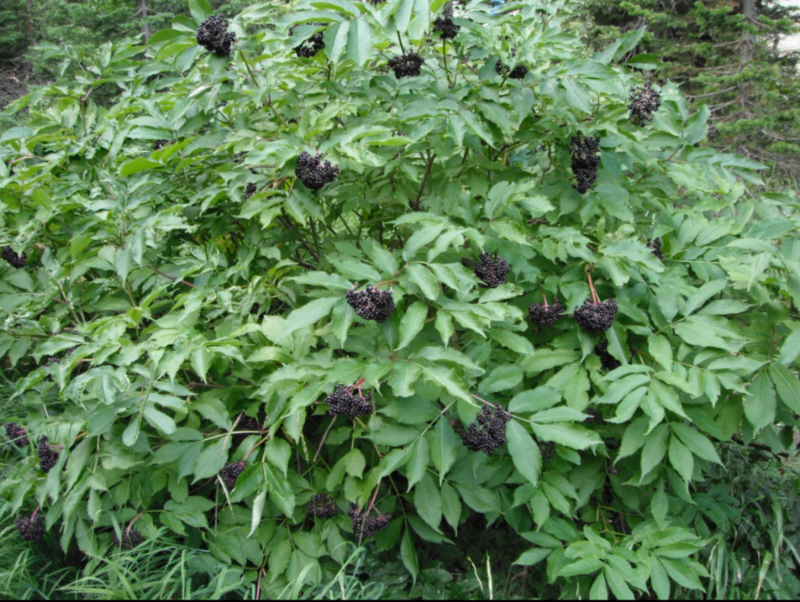 Blue Elderberry was sometimes known as S. glauca; it is more commonly known as Sambucus cerulea (or caerulea), but many botanists feel that it and the American Elderberry, Sambucus canadensis, are just a subspecies of the well-known European species, the Black Elder, Sambucus nigra. Distribution: Blue Elderberry is found from southern British Columbia to California; to western Montana through west Texas. 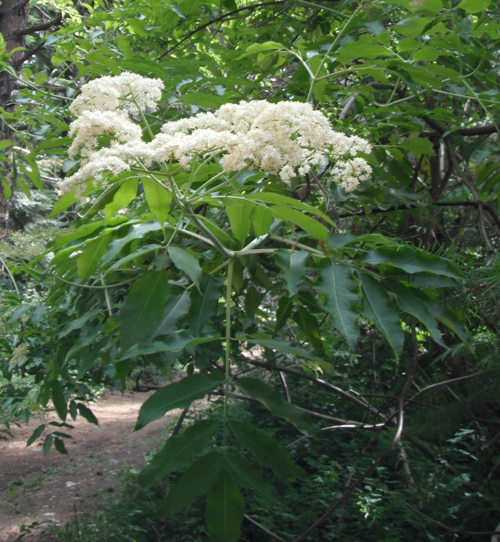 Growth: Sometimes tree-like, Blue Elderberry grows 6-12 feet (2-4m). Habitat: It is generally found in drier open forests, edges, and slopes; often along roadsides. Wetland designation: FACU, it usually occurs in non-wetlands but occasionally is found in wetlands. 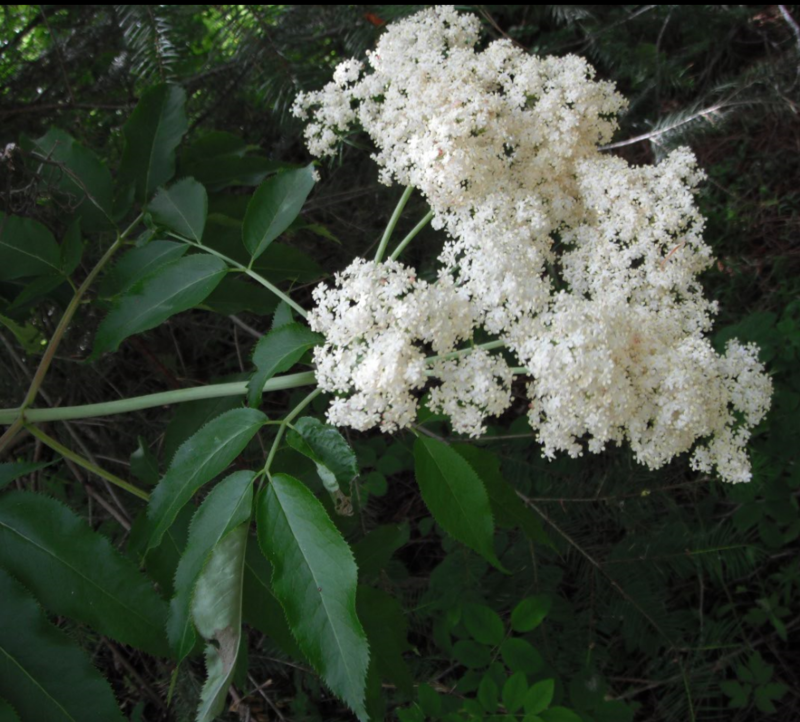 Diagnostic Characters: Blue Elderberry has opposite, relatively large, pinnately-divided compound leaves with 5-9, broadly lance-shaped, smooth, toothed leaflets. Small, creamy white flowers are borne in flat-topped clusters. Berries are bluish-black, with a waxy bloom, making them appear powdery blue. Twigs are soft and pithy. In the landscape: Elders can be a little wild but overgrown plants can be cut back severely. Blue Elderberry can be used as a hedgerow, as a screen, or planted at the edge of a forest. It is most often grown for its edible berries and to attract birds. 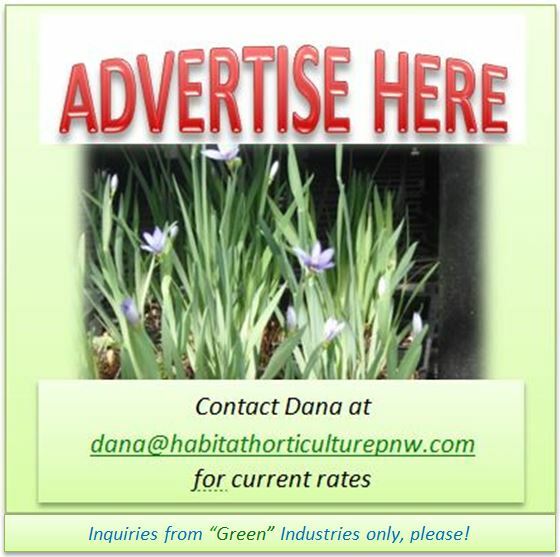 It is also valuable for revegetation projects, and to stabilize slopes and streambanks. Phenology: Bloom time: May-July; Fruit ripens: August. Propagation: Stratify seeds warm for 90 days, then stratify for 90 days at 40º (4º C), or sow as soon as seeds are ripe in a cold frame. Blue Elderberry is easily propagated by cuttings; either semi-hard wood in July or August or hardwood in autumn. Layering is also possible. 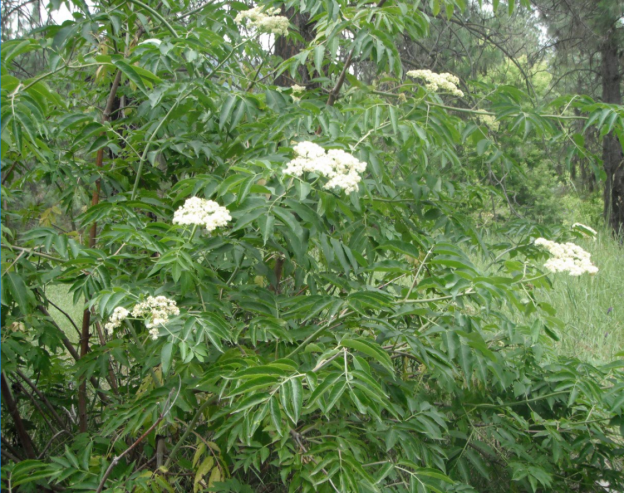 Use by People: Elder trees were important in Celtic folklore and mythology; they were considered sacred to fairies and were used for making wands. The “Elder Wand” was one of the “Deathly Hallows” in the Harry Potter book series. In Europe, elderflowers are widely used to make syrups, cordials and liqueurs. The pith was by watchmakers for cleaning tools before intricate work. The fruit, on both continents, is often used for wine, jellies, candy, pies, and sauces. Northwest natives ate the berries fresh, dried, steamed, or boiled. Raw berries, especially if they are not fully ripe, may cause some people to experience an upset stomach. The bark and leaves were used to induce vomiting and as a laxative; externally applied, they were used for pain, bruises, swelling, and as an antiseptic. The flowers were made into a tea to treat cold and flu symptoms. The berries were used to make a black or purple dye; the stems to make an orange or yellow dye. Hollow twigs were used for flutes, whistles, pipes, blowguns and squirtguns; whistles were use to call elk. The soft wood was used as a twirling stick to make fire. 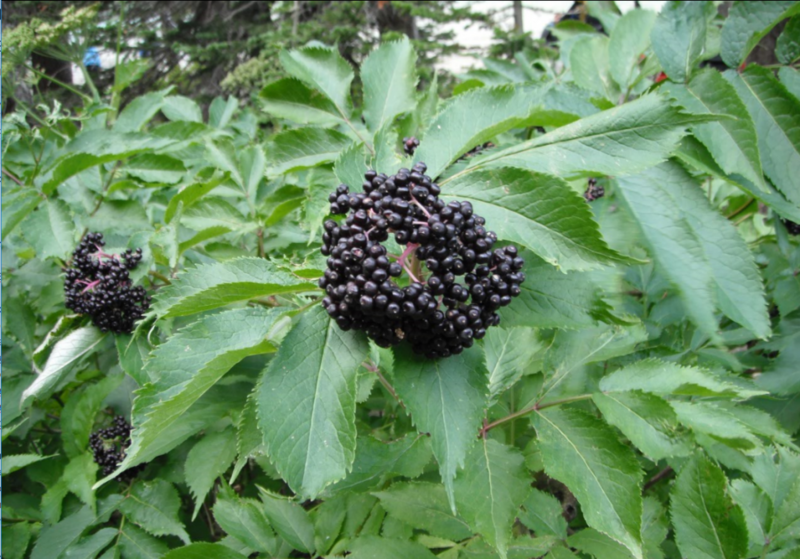 Use by Wildlife: Blue Elderberry is an extremely valuable shrub for wildlife. It provides valuable cover and nesting sites for birds and small mammals. Its fruit provides food for many species of birds including: jays, woodpeckers, pigeons, grosbeaks, robins, thrushes, bluebirds, towhees, tanagers, and many others. Squirrels and other small mammals also eat the fruit. Flowers are mostly pollinated by insects but hummingbirds will visit the flowers for nectar. Elk and deer browse the foliage. This entry was posted in Deciduous Shrubs & Vines on March 13, 2017 by habitatdana.